Okay, I had a revelation today and wanted to share with you guys, as well as for you to share your own stories! And I just.....COMPLETELY AND UDDERLY FELL IN LOVE WITH THE ART. I have NEVER felt this way towards any card EVER of the 10+ years I've been buying boosters. NEVER EVER. And I just.....oh my gosh it's just so BEAUTIFUL. My view of Beartic has completely changed because of this card! I used to not like it at all but now.....ugh I can't get enough! 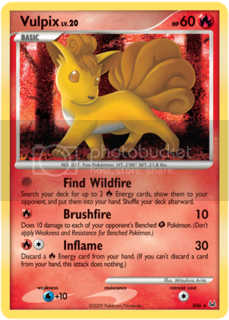 So my question to you: Has the art of a card ever completely captured your imagination or changed your view of a certain Pokemon, no matter how random of a Pokemon it is? I just want to make sure I'm not crazy if I'm the only person who's ever felt this!! Hello to my dearest ladies and gentlemen! You may know me from two years ago, or you may know me from my odd comments and buying of stuffs here and there. My name is Ceridwen, but you can call me Abe. I thought I owe you guys at least a little sneaky peeky at what my collection's grown to! Hey guys! Updating on Trux's GB and those who already paid for your GA winnings to be shipped out. I'm SO SORRY!!! D: Firstly, the stores have been out of bubble mailers (I'm insanely serious) and 2. I have been so busy that the 3 I actually managed to get and packed up I haven't had a single ounce of time to hit the post office so I ask that you PLEASE be patient. They'll get sent out with tracking! Now on the GB, like I haven't had time to run to the post office I've had only an ounce of time to sort it out. 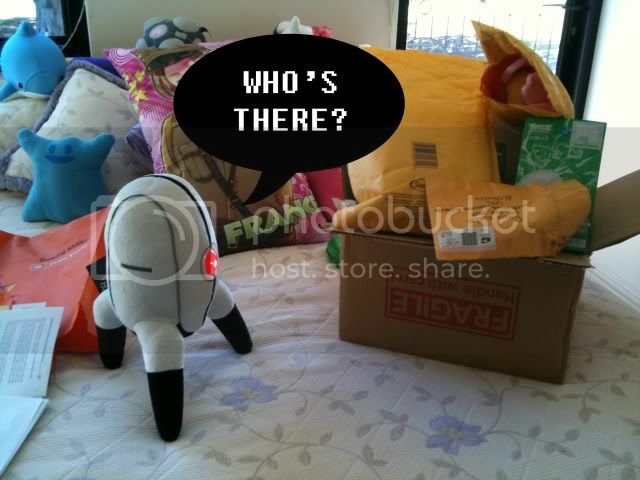 One problem is is that the dusknoir attack kid is no where to be found. I'm sorry to the person who claimed it, I will be deducting his amount from your shipping total. I told Trux about it and he said he'd look for it and would mail it to the person directly for me if he did. I'm going to seriously try to get to the post office today but classes usually keep me until it closes so fingers crossed. Sorry again guys for the delay! My bottlecap collection is the pride and joy of my entire collection! And it is now complete! So this brings me to my wants! I could create a huuuge list but these are my main wants. I'm going to keep an eye on this community because it seems like there's something for everyone here! Thanks for making me feel welcome so far, and I look forward to hopefully giving some plushes a new home! New side collections probably....because it's hard for me to resist so many Generation 5 Pokemon. It has now become my second favorite out of all Gens (Gen 1 being the first out of nostalgia). I am not sure if there are certain rules to it, I guess it depends on the people? 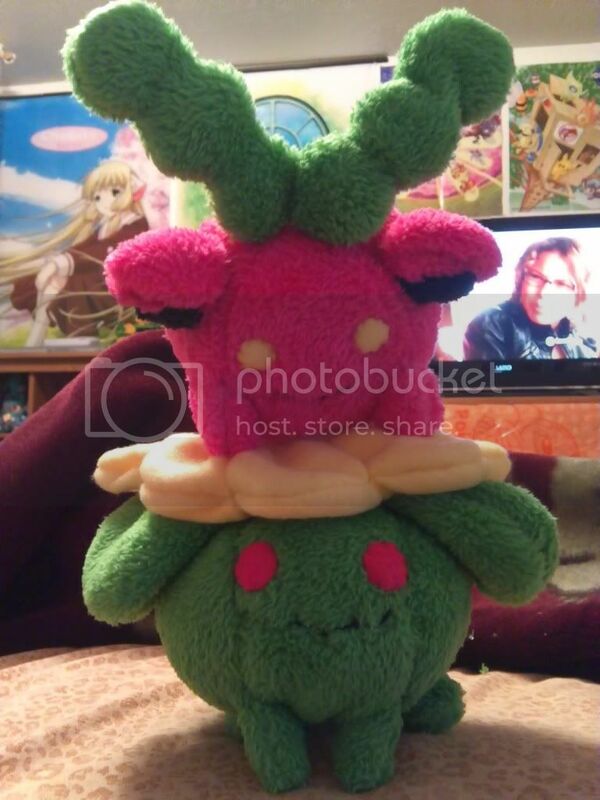 As for me, main collection means to me that I try to own as much merchandise of a certain Pokemon (that is Charmander, Mantyke line, Snivy line and Gold/Hibiki for me) that I love the most and would not abandon them for a long time, including plushies, figures, flats etc. 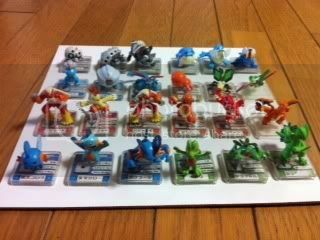 Side collection means to me that I love a certain Pokemon, but do not have to own every merchandise, just get the most interesting ones (Riolu, Wynaut, Joltik line, Scrafty, Deino line, Ash and other humans, etc). Hope I make sense! Today, I bring you some spiffy Kids Figures for sale!! Enough of the rules, let's get to the sales!!! Received my first lot of stuff from this comm! 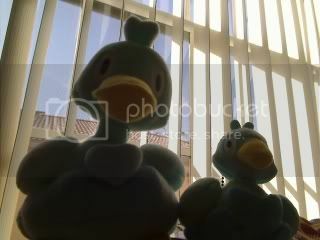 Going on a trip to Disney World + Duckie gets! First off, if anyone is expecting a reply from me and hasn't received one yet, please let me know. My notifications were iffy a couple days ago so I might have missed someone's reply to a comment thread. I tried going back to check them all but I might have forgotten some. I don't need the Victini bottlecap, but I would be interested in everything else in the box...especially the Jumbo card and the holo card. And...my friend sorjei is considering doing a custom plush to get me one of the following plush for my birthday. So, if you'd be interested, please let me know. I also might be willing to buy the plush directly depending on price. Epic wants post of dooooooom! So, its payday and seeing as my trip to America has been cancelled I feel like SPOILING myself by tackling my wants post! Be warned this is very image heavy guys! so if you have any Raikou, Suicune, Entei and Shinx line items you wanna get rid of then take a look! Id happily buy from you! I've gotten lots of things ever since my first collection post from when I joined about a month ago. I wanted to know from other sources than what I've seen--what do you think are the rarest/most valuable cards out there? Also even though I've searched for awhile, does anyone know where I can find a list of all of the jumbo cards released? I might just be missing an article on bulbapedia, or maybe I should put some time and effort and make a page on the pkmncollectors wiki. Hey everyone, it's been a while since I've had a chance to post on here. So busy with college and what-not. BUT! I have been lurking a bit still. I come to you today just simply looking for stuff. I haven't really bought any poke'merch in a while and I figured it would be fine to spend a little on some new stuff. Raikou. Yes, I have decided to add Raikou to my collections. Emonga Type Focus Cell charm. Also, Chamander and Emolga Canvas plushes. I haven't posted any wants in awhile! As people know i collect Cyndaquil line! I'm reaching a standstill however.. where i just keep finding the same things... So i'd like to see anything anyone has they're willing to part with! I'm desperatly after the Cyndaquil Minicot (I keep missing it...) & Cyndaquil Pokemon Time items! But i'm also looking for ANY OTHER CYNDAQUIL LINE ITEMS! But please keep in mind that i do have ALOT of the common items.. like Kids etc..
Eeveelution auction items are being boxed/packed and will be shipped once money transfers to my account! R/S/E Zukan set 7 Group Auction - reminder! Hi all - This is just a reminder that the group auction for the r/s/e Zukan set ends early tomorrow morning. There are still lots of Zukan at their starting bids and all of them are at very low prices still, so put your final bids in! 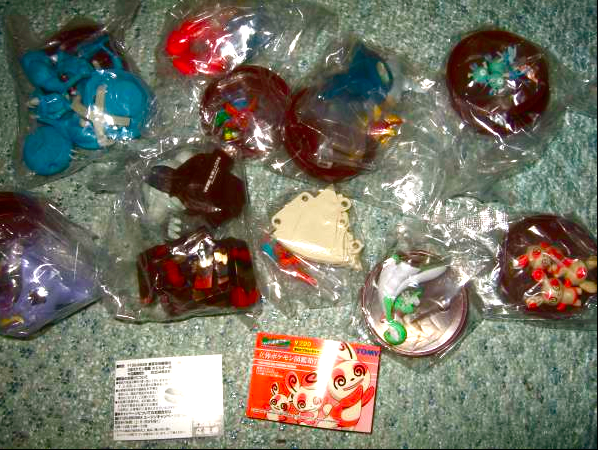 The lot includes Sharpedo, Gardevoir, Magnemite, Spoink, Masquerain, and more. We still haven't quite reached enough to put a starting bid so don't be afraid to go over the start prices. Hello lords and ladies. It's been awhile. As usual. But I'm still alive and kicking. 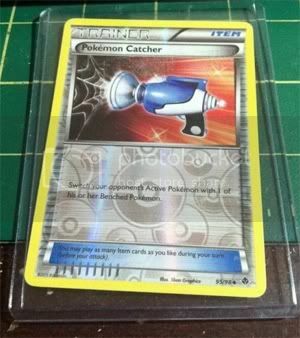 So I have a fresh from the pack Reverse holo Pokemon Catcher card that I have no need for. I'm happy to let it go for 12 dollars if anyone wants it. As for the much more fun part of this post... cell charm commissions gooo~! I have 3, and only 3, custom keychain slots open. Click the Snivy to be transported for photos and information. I also have some pre-made keychains still available, so ask if you are interested in any of them. Can be combined with any other orders. I have separate entries for Pokemon merch and cards. Sales permission granted 7/11 by dakajojo.